PanARMENIAN.Net - Professor Richard G. Hovannisian visited Armenia on the threshold of the Armenian Genocide centennial. On April 21, the presentation of the Armenian version of “The Republic of Armenia, Vol. II: From Versailles to London, 1919-1920” by the prominent historian was held in the RA National Academy of Sciences. 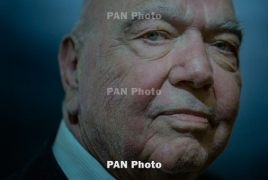 PanARMENIAN.Net talked to prof. Hovannisian on some issues. This year marks the centennial. Some people are afraid that if the Genocide is not recognized and reparations are not paid before the centennial, the issue will be lost and gone forever. This, however, is not true. The reality is that the struggle is and will be going on. The Armenian Genocide centennial is an important milestone that we need to mark. And I must confess our unified efforts met great response this year. The problem has not been solved yet, but we have progressed much: the memory of the Genocide survived and spread outside Armenian communities. 42 out of 50 U.S. states, as well as hundreds of cities, councils among others have officially recognized the Armenian Genocide. The administration just needs to reaffirm, yes, reaffirm what has already been declared, as former presidents starting with Woodrow Wilson have not only recognized, but also condemned the Armenian Genocide, perpetrated in Ottoman Turkey. We forget this fact very often. But today we want Barack Obama to keep his promise and reaffirm the United States’ recognition of the Armenian Genocide. Pope’s message has changed much. Germany is on the verge of recognizing the Armenian Genocide, and this is a big step forward for a country that remained neutral before. I believe this could have a certain impact on Obama’s speech and the expressions he could choose to utter. Obama has been using the term Mets Yeghern for already 2-3 years, and the correct translation of the expression would be Great Crime and not Great Catastrophe. And the Armenian community and lobby need to make this clear, like Jews came to describe the Holocaust as Shoah, and the world now recognizes the terms equally. Maybe we, too, need to use not only the term genocide but also spread our own Mets Yeghern that was previously in use. The term genocide is relatively new, and we need to make the world learn the real meaning of Mets Yeghern, i.e. Great Crime. Richard G. Hovannisian is Professor Emeritus of Armenian and Near Eastern History at the University of California, Los Angeles. He served as the Associate Director of the G.E. von Grunebaum Center for Near Eastern Studies from 1978 to 1995. A member of the UCLA faculty since 1962, he has organized the undergraduate and graduate programs in Armenian and Caucasian history. Dr. Hovannisian, a native of Tulare, California, received his B.A. (1954) and M.A. (1958) degrees from the University of California, Berkeley, and his Ph.D.(1966) from UCLA. He was also Associate Professor of History at Mount St. Mary's College, Los Angeles, from 1966 to 1969. In 1987, Professor Hovannisian was appointed the first holder of the Armenian Educational Foundation Endowed Chair in Modern Armenian History at the UCLA. He is currently organizing conferences on Western Armenian provinces worldwide, collecting, processing and publishing related materials. 13 volumes on the subject have already been published, while another one will be dedicated to Musa Dagh and Kessab.